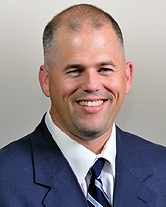 Andy Hayes is the owner and president of TCC Sports, LLC and Gameday Magazine. Hayes founded TCC Sports in 2001 and is the visonary for the company and its various marketing concepts and products such as Gameday Magazine. Since its inception, Hayes has developed TCC Sports into one of the fastest growing multimedia companies in the state of Virginia. TCC Sports is set to expand its marketing concepts and products across the country and has already spread into 8 markets in Virginia. Hayes oversees the day to day operations and also hosts several TCC Sports television and radio shows. He is also a graphic designer and still plays an active role in the design concepts and development of Gameday Magazine and the official website of Gameday Magazine. Starting a sports related business was the natural thing to do for Hayes as he is the son of former Washington Redskins secondary coach and current New Orleans Saints Defensive Backs Coach Tom Hayes. Hayes' father spent 10 years as UCLA's Defensive Coordinator in the 1980's while he was just a young boy. Hayes became a ball-boy for the Pac-10 at age 7 and had the proud responsibility of catching the football for Bruin Legend and Hall of Fame NFL Quarterback Troy Aikman in pregame warmups. That experience and many more like it helped motivate Hayes to start a sports related business. "Being around sports is what I know, it's been my life, and this business has allowed me to stay close to the game. TCC Sports is not just about sports though, we are here to make a difference in our community and that mission is our motivation. I believe we have just begun our journey and we are excited about the future at TCC Sports." Hayes started his own career in sports after spending his college years playing baseball for the Virginia Tech Hokies. Hayes played first base for the Hokies and was a member of the 1997 Atlantic 10 Championship team that reached the NCAA regional tournament. After a foot injury ended his career, Hayes spent time coaching baseball at Blacksburg High School where he helped lead the Indians to the playoffs and their best record in school history at the time. In high school, Hayes was a two-year letterman in football and baseball for Norman High School in Norman, Oklahoma. During Hayes' time as a quarterback and starting first baseman, the Tigers won the 1992 state championship in football with a 12-2 record, and also won the 1995 6A state championship in baseball with a 34-5 record. In a 6-3 win over Midwest City High School in the state championship, Hayes was the only senior in the championship game for the Tigers to finish with a RBI after driving in the first run of the game on a single in the first inning. Hayes and the Tigers finished their season ranked 16th in the country by the USA Today. In 1994, Hayes and the Tigers raced to a state runner up finish to set the stage for their magical 1995 championship run. The experiences of winning championships in high school and college at a national level have helped Hayes build TCC Sports into a successful company today. "I look back on my experiences in high school and college and I believe strongly that it has helped shape the person I am today and also the way I run our company. We achieved some unbelievable things and I am very proud of our accomplishments. Those championships are still some of the greatest moments in my life. I hope I can achieve something just as great in my business career with TCC Sports." Hayes lives in Loudoun County with his wife and two sons. Hayes graduated with a degree in Interdisciplinary Studies in 2000 from Virginia Tech. 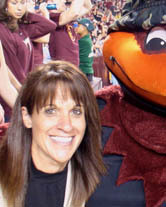 After watching from the bleachers for years, Helene Shain decided in the winter of 2008 to join the Gameday team as operations manager. Shain is no stranger to Loudoun sports as all of her three sons are stellar athletes. Her oldest son Kellen played for Broad Run as a linebacker, and her son Cole recently graduated after leading the Spartans to a school record 10-0 record in football as the team's starting quarterback. He also signed to play college baseball for William and Mary. Helene's youngest son Logan will soon be a Spartan, but in the meanwhile, she has taken over as Gameday's operations manager. Her responsibilities include overseeing Gameday Magazine's sales and marketing efforts, managing Gameday's client relationships, and organizing Gameday Magazine's distribution. You won't find Helene in front of the camera, but she plays a vital role in Gameday's continued expansion in the area. From The Owner's View:"Helene is a crucial part of our team because she knows the impact first hand of our products," said Hayes. Her organization skills and ability to focus on the tasks at hand help keep our company moving in the right direction on a daily basis." More Bios to Come Soon!